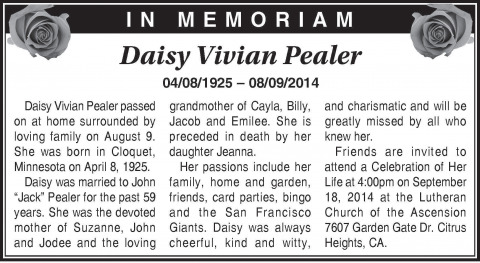 Daisy Vivian Pealer passed on at home surrounded by loving family on August 9. She was born in Cloquet, Minnesota on April 8, 1925. Daisy was married to John “Jack” Pealer for the past 59 years. She was the devoted mother of Suzanne, John and Jodee and the loving grandmother of Cayla, Billy, Jacob and Emilee. She is preceded in death by her daughter Jeanna. Her passions include her family, home and garden, friends, card parties, bingo and the San Francisco Giants. Daisy was always cheerful, kind and witty, and charismatic and will be greatly missed by all who knew her. Friends are invited to attend a Celebration of Her Life at 4:00pm on September 18, 2014 at the Lutheran Church of the Ascension 7607 Garden Gate Dr. Citrus Heights, CA.